Passed from this life on Sunday, September 9, 2018 at 10:30AM at the Milwaukee Catholic Home where he was undergoing physical rehabilitation. He is survived by a sister, Rose Ellen Hehr, her children, and a host of friends both in the U.S. and abroad. He leaves behind a legacy of musical inspiration and influence on many musicians, organists, vocalists, instrumentalists, choir members, and listeners with whom he came into contact for over 48 years in his music ministry in Milwaukee. A number of those whom he mentored have gone on to make significant contributions in musical performance, especially in the area of the music of the church. So, in a sense, he has a large successful musical family. He was born and educated in Ohio, graduated from the Cincinnati Conservatory with a Master’s degree in Organ Performance, studying with Wayne Fisher, a student of Marcel Dupre in Paris. He won the National Organ Playing Competition in Fort Wayne, Indiana at 21 years of age in 1960. Shortly thereafter, he was selected by a search committee headed by Mrs. Edmund Fitzgerald at St. Paul’s Episcopal Church to be its Organist and Choirmaster. He remained there for 12 years, providing music for worship and producing frequent concerts of remarkable excellence and beauty. He made recordings at St. Paul’s of both organ and choral works with a group he founded called Outreach: Music of the Church. Some of the recordings are available on YouTube and Spotify. Following that, for 2 years, John was the Organist at the Cathedral of St. John the Evangelist. His last position was that of Organist and Director of Music for 32 years at the Church of the Gesu on the Marquette University campus. 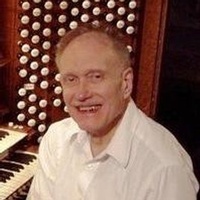 There he collaborated with members of the St. Louis Jesuit musicians to effect powerful organ/guitar accompaniments for a number of their compositions. He played the organ for thousands of Masses, weddings and funerals, graduations, and various other services during his tenure. In addition to all of that, he gave monthly recitals as a way of raising money for the church’s organ fund. Most significantly, he designed the rebuild of the Gesu Kimball organ by the Schantz Company which ranks as one of the largest and most colorful organs in the state. It remains a tremendous testament to his knowledge of organ building. His desire to create the most beautiful organ music possible compelled him to study the organs of Europe, especially those in the French cathedrals. The highlights of his career were to perform at Notre Dame Cathedral in Paris for 5000 people and at St. Pierre Cathedral in Angouleme, France. John’s talent, knowledge, artistry, and encouragement will be missed. A celebration of John’s life will take place on his 80th birthday, Saturday, October 13th, at Gesu Church, 1145 W. Wisconsin Avenue in Milwaukee. Choral prelude music will start at 6:30PM, which all vocalists are welcome to join. A memorial service honoring John’s life will begin at 7:00PM, with a reception to follow. Memorials in John’s name may be made to the charity of your choice. Choral Prelude Music. Vocalists welcome to join. © Copyright 2014 - 19 FEERICK FUNERAL HOME. All Rights Reserved.